Hunting is in my blood. I can still remember being five years old with a BB gun in my hand stalking the south Texas brush. Back then, my game of choice was just whatever I could get close enough to: rabbits, lizards, assorted birds, etc. Close to fifty years old now, that little Daisy rifle is still propped up in the corner of my den. Its job these days is stopping the neighborhood cats and dogs from making a deposit on our property. They don’t linger long, let me tell you. I killed my first big game animal—a feral pig of about 200 pounds—as a sophomore in high school. In the decades since, I’ve hunted with air rifles, bows, handguns, shotguns, rifles, slingshots and even spears. I've guided bow and gun hunters both here in the U.S. and overseas. I have followed up wounded game for other hunters and learned much about game trailing. While I started shooting competitively only in 1985, hunting has always been a constant. I’ve competed across the U.S. and all over the world in many disciplines. But truth be told, even these competitions turned into great excuses for exciting overseas hunts. These days, one of my pleasures is introducing more traditional hunters to non-traditional equipment. I like them to see the new possibilities for harvesting game. This is a great way for them to understand the utility of that equipment even for traditional sporting use. Hunting is something I enjoy, but also something I take seriously. The more I’ve learned myself, the more I’m aware of how little others know about game anatomy or bullet performance. Hunting an animal carries a responsibility to minimize its suffering as much as possible. Naturally, your choice in weapon and gear all play into how well you live up to that responsibility. But while it always comes first, I don’t believe it needs to tie our hands. Just because the old ways have been proven to work doesn’t mean that new ways can’t work as well. Hunting can keep pace with innovation. My hope in writing this is to show other hunters that matters of preference don’t need to be matters of principle. Just because a hunter has no desire to own or use an AR does not mean that they are unfit for hunting use. In fact, many ARs will outshoot the most common, over-the-counter "hunting" rifle. Many will remember the sentiment that was shared by Jim Zumbo about his dislike for ARs and other "terrorist rifles.” I have had numerous friends over the years that felt the same. It was only through education and patience that I managed to change their minds. Most feel that MSRs are inaccurate, spray-and-pray type guns. As the story goes, they have no legitimate use by anyone except law enforcement, the military and bad people. This attitude is carried forward by so-called "experts" or media personalities with access to the airwaves. As a misguided compromise, they’ll say there is "no legitimate sporting use" for these guns. Well, thousands upon thousands of practical shooters around the world are proving otherwise every week. 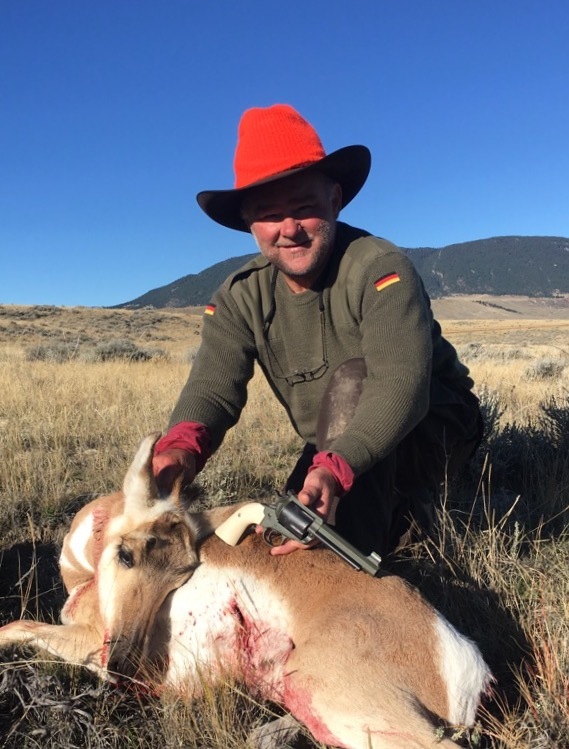 There is a legitimate sporting use for AR-type rifles, and there are many capable, responsible hunters who take to the hunting fields with them. They not only do that job well, they excel. Making nice arguments is one thing, but the proof is in the pudding. So, I’m going to run down my experience with AR hunting and the cartridges I use. I’ve had great fun and great success with my ARs over the years, and I find they’re often the perfect choice. It’s all about having the right tool for the job, and selecting the right caliber and load is a huge part of that. So, let’s get into how I hunt with my ARs. By the end, I trust you’ll see that good hunting is about the quality shooter and not the kind of gun he’s using. This month, we’ll start with my small-frame favorites. Many competitive coyote hunters as well as varminters protecting livestock for ranchers and farmers make good use of the AR-15. More often than not, they’re using its original caliber of 5.56x45, or in civilian guise, .223. So, I'll start there and cover this cartridge’s use and occasional abuse. This caliber is more than capable for animals weighing 100 lbs. or less. With some of the premium bullets available today, it’s safe for animals up to even 150 lbs. I've used my ARs for prairie dogs, jack rabbits, coyote, fox, bobcat, feral hogs and javelina. My JP CTR-02 is phenomenally accurate—on the order of ½ MOA, on paper making it a suitable prairie dog slayer out to 400-500 yds. Now, we all know that what paper says and what happens in the real world don't normally jive. In this case, I can routinely take prairie dogs out to 500 yards. In fact, it becomes boring whenever any showed up inside of 400 yards. On one hunt, my shooting partner and I even started taking moving shots on targets less than 400 yards. 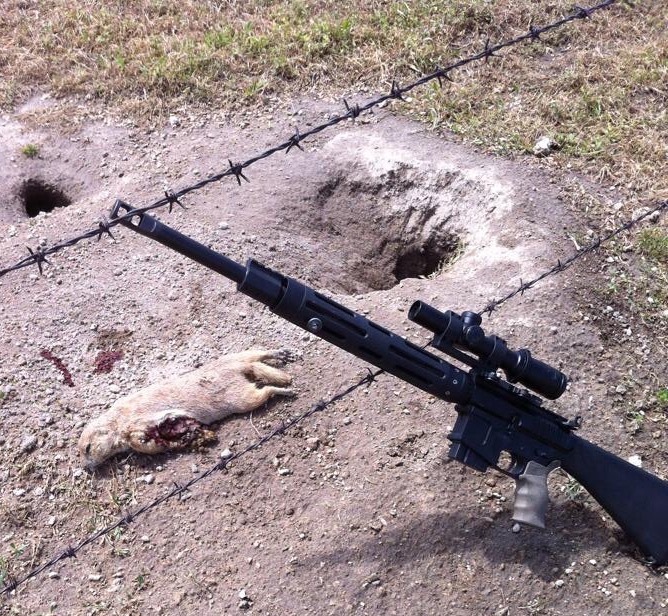 The light weight of the gun lends itself well to a “walking- around” prairie dog slayers. Plus, thanks to my experience shooting competitively, I can tell you that lots of shooting won’t affect accuracy, which is a welcome benefit. I leave the rifle just as I use it for 3-Gun, running a 1-6.5x scope with my normal 250-yard zero. Getting extra practice with the gun set up that way is another benefit. I've used some of my other ARs for predator calling, and the .223/5.56 is perfect for game of that size within 300 yards. When using the .223 on larger game—say over 100 lbs.—it becomes marginally adequate only when everything goes right or when using premium bullets. For larger game, more bullet weight is better than trying to be ultra-precise with a light-weight round. That type of behavior irritates me to no end, and it’s exactly what I don’t want to see. Every animal deserves a humane death. Use more bullet and place it where it will do the most good.